Games2U, mobile fun for the whole family! What do you do when the economy tanks and it's time to reinvent your career? You play games, of course! What do you do when the economy tanks and your main source of income is snatched from under you? You play games! At least, that’s what seems to be working well for Greg Nelson, a Games2U franchise owner. Birthday parties for your kids? Fundraisers for the PTO? Need a fun activity for a kids organization or maybe a neighborhood block party that all ages can enjoy? How about a team building activity for your office? Games2U can accommodate it all. I recently crashed one of his neighborhood parties with my two boys and was most impressed with what I saw. Greg’s Games2U truck is fully equiped with interactive video games both inside and out as well as an impressive lasertag setup complete with strategic “cover” to assist in ambushing your fellow partiers! His truck sports two video screens on the outside and several video screens in the air conditioned interior accommodating all the top games for systems XBox 360, Playstation 3, and Wii. Between 12 and 16 kids can be entertained in the air-conditioned interior of the truck while up to 8 can play on the outdoor screens at a time. Various obstacles are set up to aid lasertag combatants in their assaults! The outdoor laser tag option was a very popular feature at this particular block party. He has equipment to supply another 20 kids here in addition to those who are playing on the truck. Kids wear headbands that light up when “hit” and guns make explosive noises when they successfully target another player. Large black panels are set up on the playing field to provide cover and obstacles for players to navigate. Guns can be set for unlimited play or given a specific number of shots to aid in competitive team play. I can just imagine the night game fun that could be had here…Greg outfits his night-players with glow stick necklaces to differentiate teams. Indoor screens come complete with satellite hookup to accommodate the latest games for Xbox, Playstation3 and Wii. Pricing varies but a typical hour and a half party can start at $249 with a $99 add on for the lasertag. The lasertag feature can also be purchased separately from the truck. He commented on the recent experience of hosting a Games2U party for the Phoenix Suns where he laughingly recalls the image of the starting lineup playing a very intense game of Guitar Hero! Greg has participated in fundraisers for schools, special olympic events and loves the opportunity to give a little back to the community. I asked Greg what he liked most about his career change and he didn’t hesitate for a moment as he explained that as a home builder, he would work on a project for over a year before crossing the finish line and recieving that “job well done” feeling. But with Games2U, he gets the opportunity “to provide great customer service for a couple hours and then see those great smiles as I head out!”. It’s a much more rewarding, less stressful job and “not to mention, great leverage with my own kids to motivate them to finish homework in record time!” says Greg with a smile! You can contact Greg Nelson at 480-695-2548 or email him at gregdnelson@cox.net. 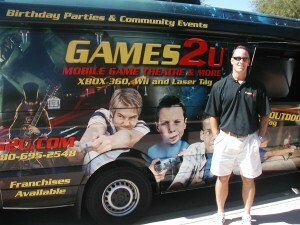 You can also find out some more about the Games2U parties at www.g2u.com. Look for the new Hamster Ball he’ll be adding very soon when you book your next party!